← The African Union summit on the International Criminal Court: In whose interest? By way of background, the First Nigerian Republic had one central government and four regions. The centre was weak and each region vigorously embarked on cash crop production. The nations income was high and education was well subsidised. Consequently, strike actions were unpopular, and the academic calendar was stable, precise and predictable. Both the affluent and poor had confidence in Nigeria’s educational system. The United Nations Educational, Scientific and Cultural Organisation prescribe that 26% of a nation’s budget should be allocated to education. However, Nigeria’s portion of the budget has, since the year 2000, never exceeded 13%. In 2012, only 8.4% was budgeted for education. Compared to other African countries, Nigeria trails behind Ghana (31%), Cote d’Ivoire (30%), Uganda (27%), South Africa (25.8%), Swaziland (24.6%), Kenya (23%), Botswana (19%), Morocco (17.7%), Tunisia (17%) and Burkina Faso (16.6%). 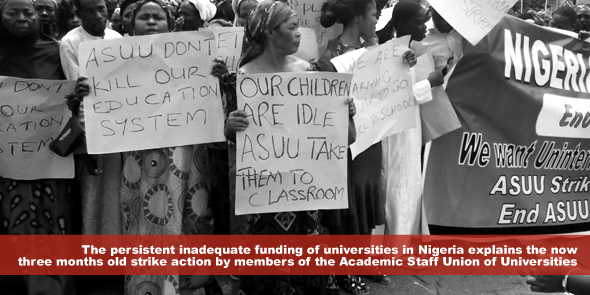 The persistent inadequate funding of universities in Nigeria explains the now three months old strike action by members of the Academic Staff Union of Universities. The Nigerian government considers funding education an expensive exercise. University campuses have consequently become, what Arko- Cobbah calls, sites of struggle between students and staff on the one side, and the duo with the government on the other. Author Teresa Hartnett observes that Nigeria’s federal universities spend only 1.3% of their budgets on research and which, according to her, accounts for the low research output and development obtainable. The federal government, as pointed out above and according to a survey conducted, has allocated only 13% of its budget to education. Nigeria’s former Minister of Education Ruqqayatu Rufai attributes the dwindling allocation and financial plight of Nigeria’s universities to pressure from other sectors. It is thought that the National Conference will adopt regionalism along the line of the six geo-political divides, namely: south-west, south-east, south-south, north-east, north-west, and north-central. Regionalism worked in the First Republic; every region generated its funds and developed at its pace. To illustrate the need for regional governance, in 2009 an acclaimed Islamic sect, Boko Haram, which is based on in the north-eastern part of Nigeria dissociated itself from calls for more funding of education. It opted for the eradication of western education. Regional governance would give the north-east region the magic wand to call the sect to order or to bow to the eradication of western education. In conclusion, I submit that regionalism will address the funding problem currently at hand and will enable education to run its safe course. Olaniyi Olayinka holds a Bachelor of Laws (LLB) from the Lagos State University and a Master’s in Law (LLM) from the Obafemi Awolowo University (Nigeria). He is the Principal Assistant Registrar (Legal Matters) at The Polytechnic, Ibadan (Nigeria). Olayinka is currently an LLD candidate at the University of Pretoria (South Africa). His research areas include public law and human rights. Education is the basis of life.The right to education has to be spearheaded always. Not only Nigeria but also African governments have depart from the poor mentality that they provide education depending on the availability of resources and incentives while the reality is that the means thereto are viable. This attitude that governments are poor when not taken into control ignorance and poverty are going to vanish Africa. AFRICAN DEVELOPMENT IS GOING TO BE BROUGHT BY AFRICANS THEMSELVES BY MEANS OF EDUCATION NOT OTHERWISE.